One of my colleagues asked me at work, "so what are you bringing me next?" Well, brioche. 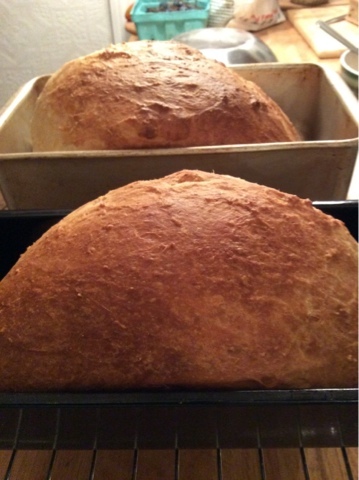 The larger of the two loaves I baked up this evening. Forgot to do the egg wash, but it really isn't necessary. I could help myself and cut into the smaller loaf. Nice and buttery. Reminds me of a croissant, but not flaky. Considering how much butter is in the recipe, eating this with butter is not needed. Would be fabulous for French toast. Will have to tinker with it to make mini ensaymadas. The other bread is a gluten free and I made this specifically for one person at work. 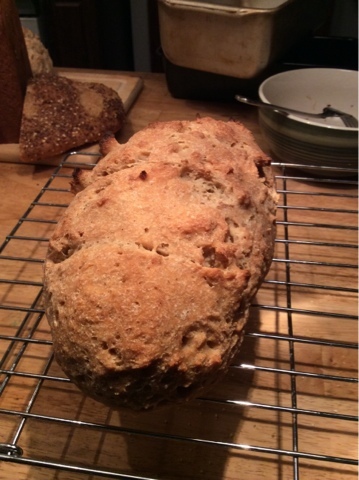 Like the brioche I made two - this somewhat shaped loaf and a misshapened mess that should never see the light of day. It's okay, but nothing something I'd eat unless I'd absolutely have to. It's made with sorghum and brown rice flour, and a heavy amount of tapioca starch. It may be in my head but I swear I can taste a fine grit. Weighs a ton. Will have to remember to bring jam or apple butter in for the bread.